Honesty. Great workmanship. We checked the BBB for a rating, and your ratings were all 5 Stars, so we decided to use your service. And we now know why you have a 5 rating at BBB. 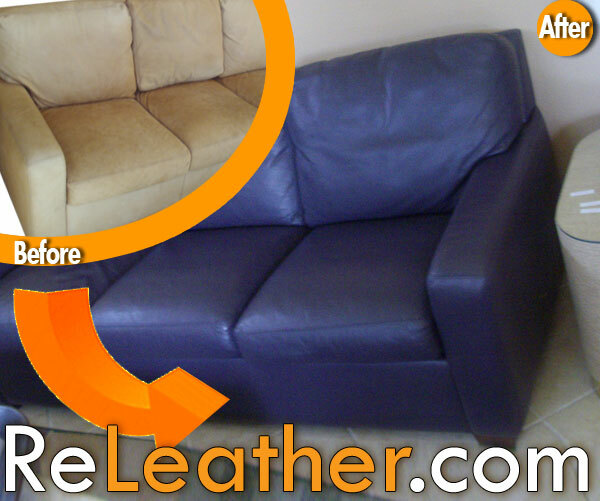 We could not be happier with how you made our leather sofa and chair look after you finished. They look better then we when bought them. 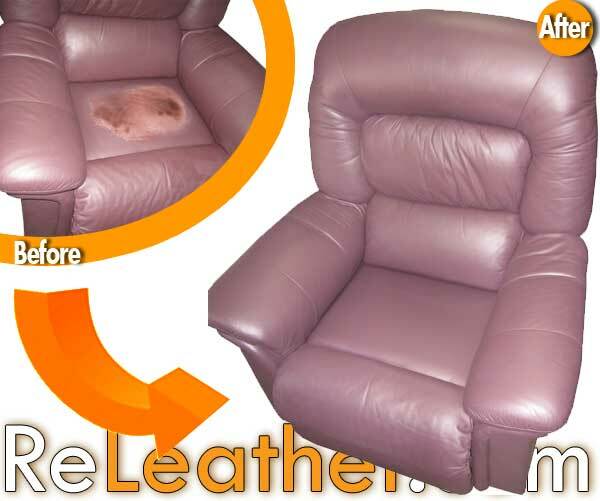 We can and will highly recommend your services for anyone looking for their leather to be renewed to original condition and better. Thank you for the service and we will add our 5 star rating to ReLeather.. Thank you for your business. We appreciate your support. 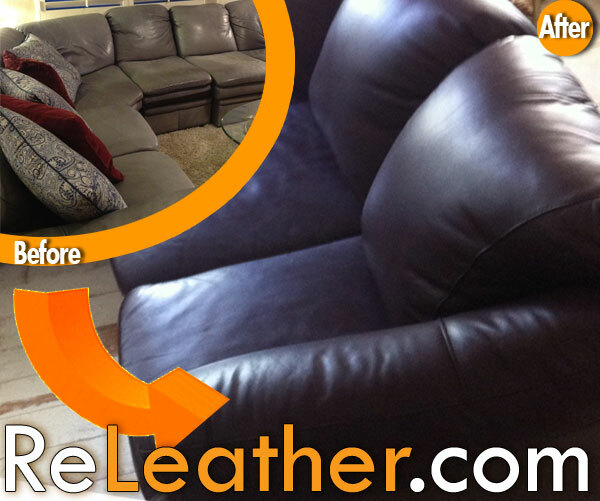 We recently had out couch and love seat resurfaced by ReLeather. 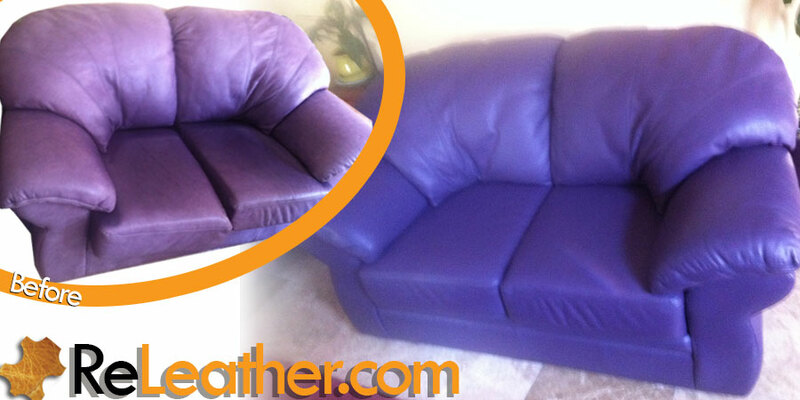 The eggplant colored leather of our couches had 13 years of ware and sun damage from our living room picture window. I did not have high hopes that they could be restored fully. When my couch and love seat were returned in just over a week, I could not have been happier. They looked brand new, flawless, and the color was perfectly restored. The owners of ReLeather picked up and delivered my furniture in person and were both knowledgeable and courteous. I would highly recommend this company. You guys are so sweet! I'm just glad you are there for my leather cleaning and repair needs. I'm sure I'll have more items to send. Thanks much! 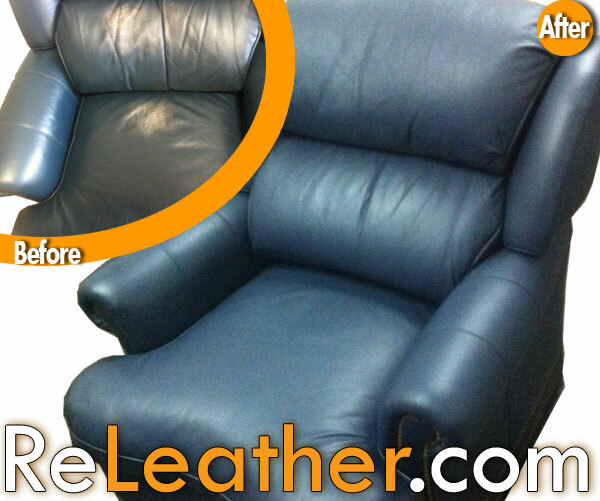 I purchased a navy blue leather recliner and ottoman approximately 15 years ago. It's my favorite chair, thus the leather was worn and showed white on the seat and back. I contacted Roberto and Jose to see if anything could be done. They assured me it would look like new and it does!! Their work is exceptional, they were punctual and completed the job on time and most importantly, they are reasonable. I'm grateful I found them. 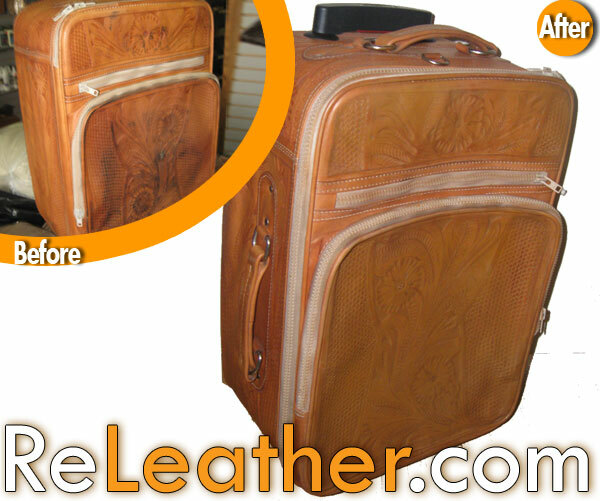 ReLeather makes the process of reworking/dyeing your leather goods very easy. Their customer service is incredible and their workman ship is even better!! Everyone I show the handbag and shoes that I had dyed very specific colors were amazed. You ability to match the color samples I sent you is simply unmatched! I am telling all of my friends about your service, many are in the fashion industry and have handbags in colors they no longer like, yet were not sure what to do with them. 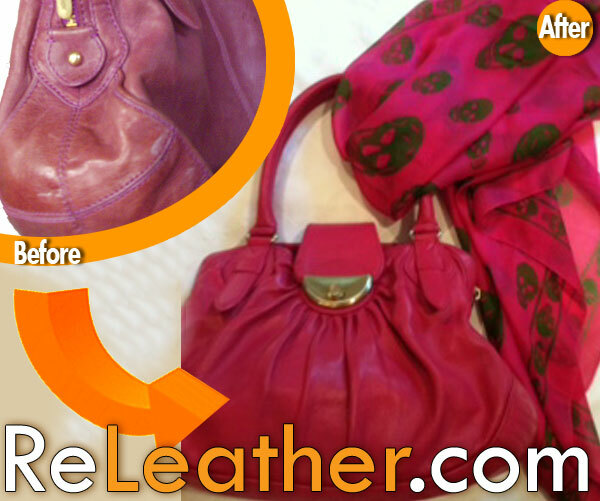 I sent a favorite fushia colored Alexander McQueen scarf as a sample...and you matched my handbag to it PERFECTLY! I purchased black leather a couch and two love seats in 1990. They were in perfect condition structurally but the leather was faded and cracked. After changing the colors in the room the black leather no longer worked for us. We shopped for new furniture but none of it had the quality of what I already had. Who knew you could dye the leather from black to brown? I was an amazing transformation! The furniture looks brand new. Roberto and Jose where punctual, accommodating, trustworthy and most importantly they know what they are doing. Everything! We had a sectional redyed from a blue to a deep burgundy. It looks like I just purchased it. Roberto and his dad were very professional and had years of experience dealing with leather. 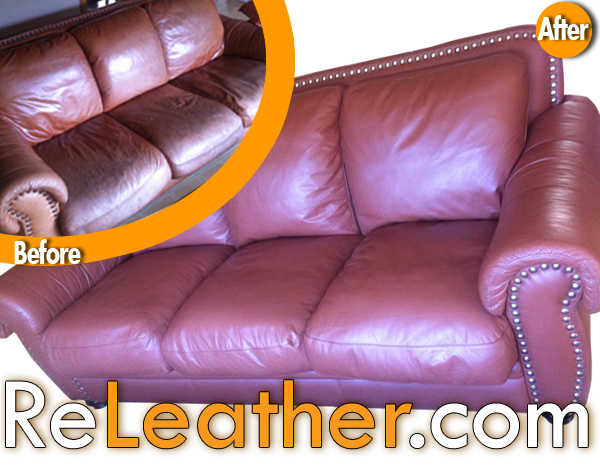 Our sectional was made of a very high grade imported leather from Italy so I was a little bit nervous until I saw the finished results. I could not be more pleased! They were very experienced. They had great suggestions. The job was done on time. You can see they are proud of the work they do and such be. I found this business through google. I took a chance sending my turquoise yves saint laurent shoes all the way to Cali. I could not be more pleased with the result. The shoes were turquoise and now they are black. The job is perfect. 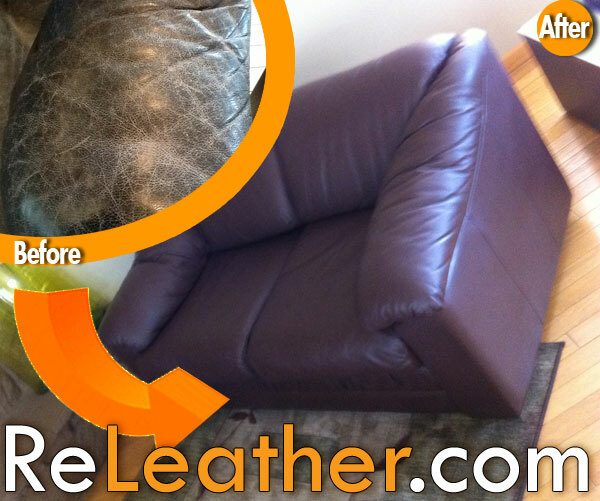 I was so pleased with the excellent job that ReLeather did on my leather furniture. My sofa, love seat, and recliner look brand new! I thought having my leather furniture restored would be extremely expensive and that it would never look like it did when purchased. I was the opposite my furniture is 10 years old and has never looked so good! It was very affordable and quality work. Thank you Jose for a great job. My experience with Releather was nothing short of excellence at its finest! I called and made an appointment that was focused on my convenience - Roberto showed up promptly. Since I had Googled the repair process I had an idea of what to expect and that helped me to understand that what he described took NO short cuts at all. Being satisfied that this was the right company to work with, I asked if we could schedule a pick up of my sofa and chair, and Roberto said he and Jose could help me right now, they had come prepared! What a pleasant surprise to not be kept waiting. So they loaded everything up in their nice clean van and promised my finished product in less than 2 weeks. Releather was true to their word. My furniture was back and looked brand new in a week and one-half. Their process is impressive and my furniture is beautiful again. That says a lot to me about their skills, commitment to quality and ability to charge a very reasonable price. Wow, I didn't know I had so much to say... After 10 years of daily use, which included sun damage to my leather (and regular use by my dogs), you would never know! The results were absolutely amazing. I couldn't be more pleased. 5 Star rating from Yelp. Read customer reviews about our services. Proud member of Angie's List of service professionals.